Brick and Mortar Music Store located in North Central Indiana. 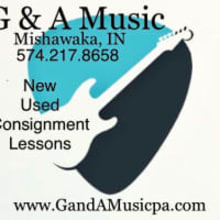 We are dealers for , G&L, Gretsch, Supro, Larrivee, Seagull and Lakland, AMI, and Peavey instruments. We carry Bad Cat, Imperial, Ampeg, Supro Peavey and Orange amps. We also have Wampler, Friedman, JHS, Vertex, Cusack, Greer, EarthQuaker Devices, Mojo Hand and Voodoo Lab!